I can’t believe I am cutting into my chocolate lollipop fabric stash again. These are some of my favorite fabrics so I have been saving/cherishing them. I made a few things last year, including a set of pillow covers, a purse, a lunch bag with a vinyl lining, and a market bag. 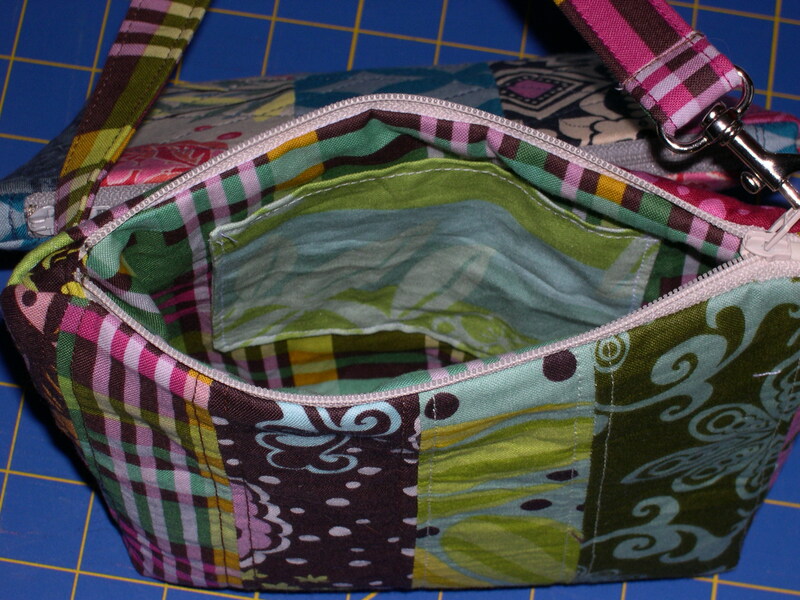 This weekend, I pulled out a pile of scraps and made this zippered bag. 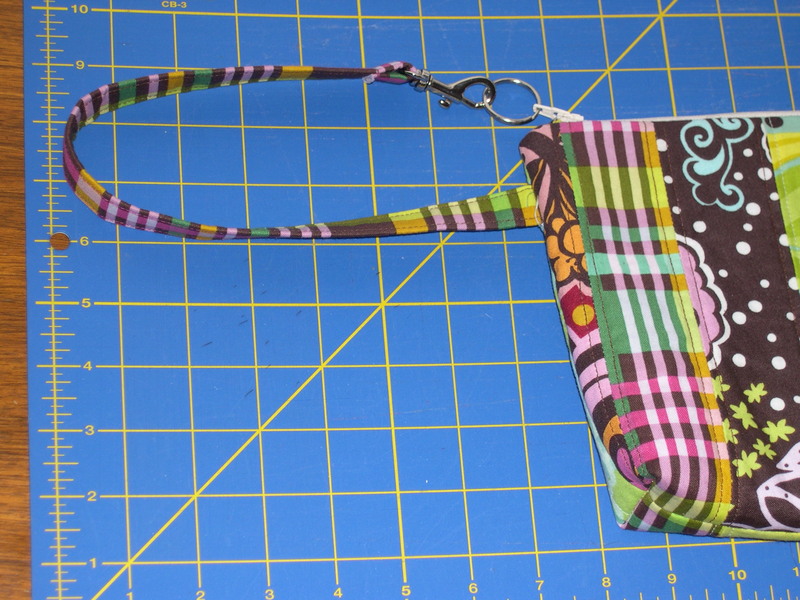 I added a handle which clips to the zipper pull on a key ring. 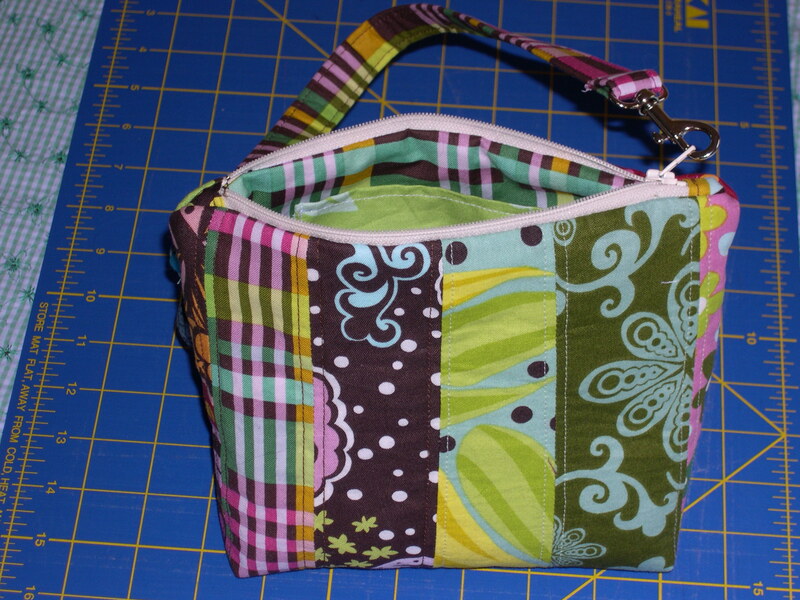 This bag was even more fun than the last one I made because I winged it more with this one. I didn’t follow one set pattern but instead made my own shape and size (8 inches X 9 inches), and added a few features I wanted in one bag. I am working on a couple fabric yo-yos to embellish the front. More cutting into the chocolate lollipop stash! I’m not following anyone else’s pattern on this one either, nor following any quilting rules or guidelines. Just piecing the way I feel like it. I’m thinking about adding pink sashing in between each row, and I am planning to add light pink and dark pink borders around the patchwork. 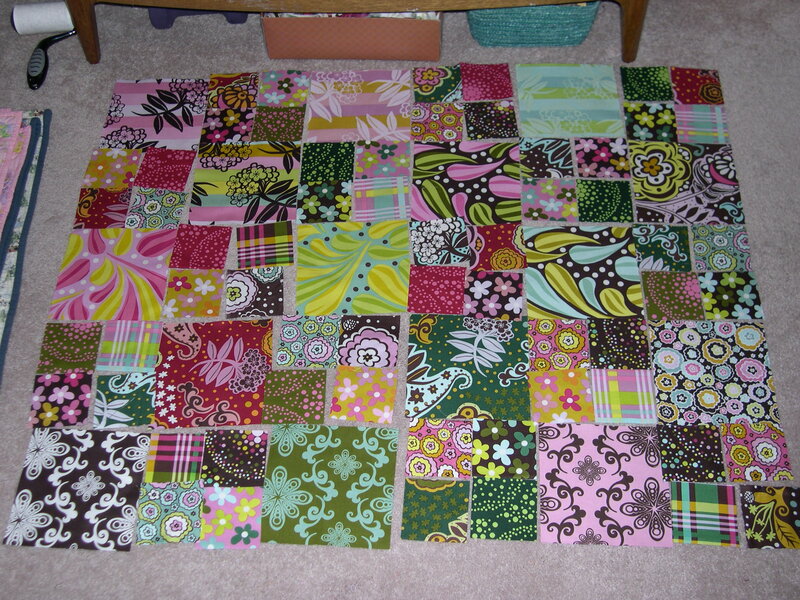 It’s going to be a very girly quilt, exactly what I want it to be! I’m so glad I finally cut into my stash to make a few more treasures. Oh, love this bag…the pocket inside is a great idea…! Your new quilt looks lovely – chocolate lollipop is one of my favourites too!! I love the patchwork at the bottom of the post. Very eclectic and great to look at! 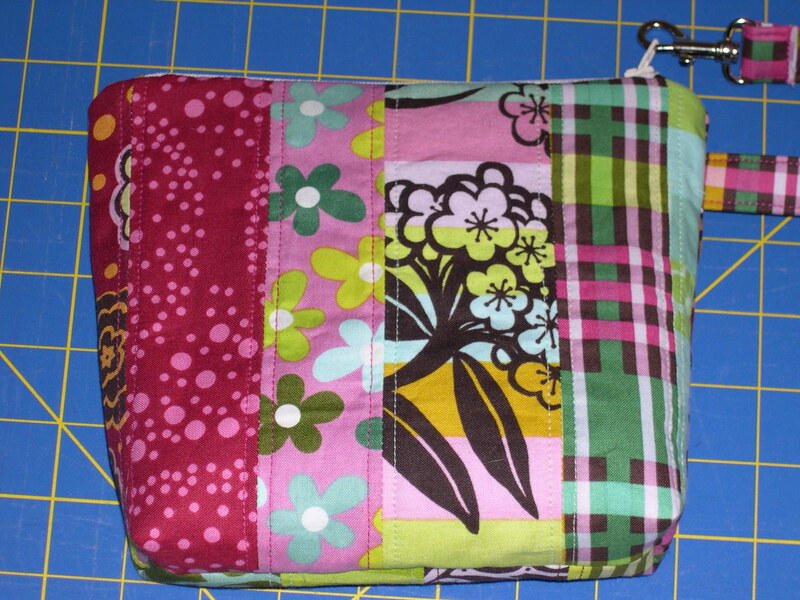 I love the patchwork bag and can’t wait to see your quilt…maybe it will motivate me to make my choc. lolli quilt. Nice bag. . .as usual! Better watch out, you may turn into the next bag diva! We can call your bag line Totally Terri! Nice colors for your quilt too. And I love the pink sashing idea. I think cutting into that treasured stash was totally worth it! All right girl, I think you’ve just given me the courage to cut into my chocolate lolli stash! Love the bag, and that quilt is going to be GORGEOUS. Can’t wait to see how it turns out! Great project. 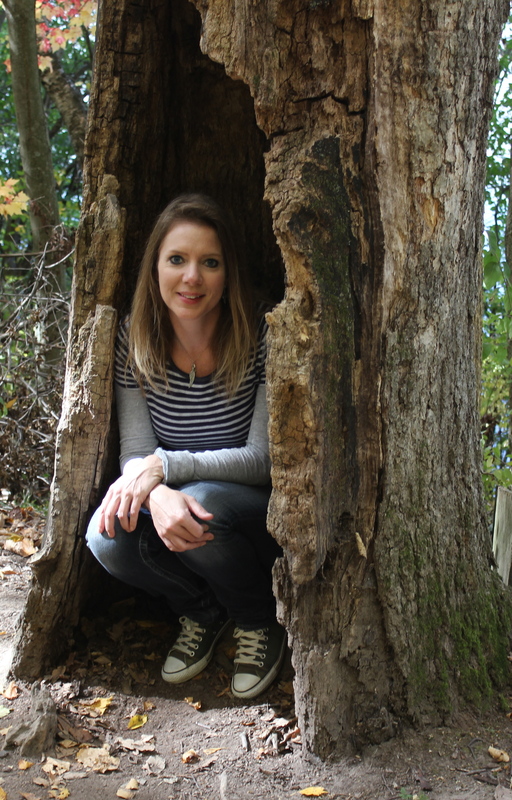 This turned out wonderfully. Love all the fun fabric combinations.